Barcelona visited the Santiago Bernabéu this Wednesday and once again, showed that no matter how much José Mourinho attempts to change his team, Barça keeps prevailing over Real Madrid. With a 1-2 loss at home and only 27% of ball possession, Real Madrid will face an almost impossible mission next week, as they will attempt to beat Barcelona at the Camp Nou. Real Madrid failed to impose their law against Barcelona tonight, as the Merengues got defeated by 1-2, in the Santiago Bernabéu. 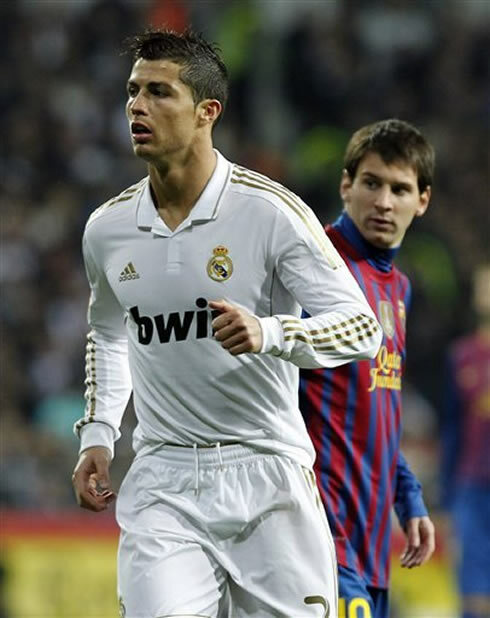 Cristiano Ronaldo still lighted the way in the 11th minute, after scoring a great left-foot goal from an individual effort, but as seen many times over the past years, Barça slowly overpowered Real at midfield with the tiki-taka game and managed to make the remontada in the 2nd half. The two teams will clash again next week and even though there's only a 1 goal difference on the scoreline, there doesn't seem to be much hope for Real Madrid, at believing in a win at the Camp Nou. José Mourinho tried to surprise Pep Guardiola, as he went with a surprising line-up, with Altintop at right-back, Ricardo Carvalho returning as center defender, Fábio Coentrão as left-back and an unusual starting trio with Benzema, Higuaín and Cristiano Ronaldo. The Portuguese coach tried to contradict Barça's tiki-taka with a muscled midfield, placing Pepe and Lass Diarra side by side, in an attemtp to destroy the Blaugrana's passing game style. It's safe to say that the mission failed as Barcelona ended the game with an outrageous 73% ball possession, against an humiliating 27% from Real Madrid. Despite the negative result, the Merengues started the game with the right foot, as Cristiano Ronaldo exploded in a sprint close to the 11th minute and fired for the 1st goal of the night, after a quick dribble on Gerard Piqué. Ronaldo's fighting spirit and great goal against Barça, somehow seem to have convinced the Bernabéu and there was nothing but applauses heard from the crowd, as CR7 celebrated with his teammates. Could this mean that the Santiago Bernabéu fans are really going to support Ronaldo from now on, in both good and bad moments, or is this another chapter of a never-ending novel? José Mourinho's men fought bravely to hold the 1-0 until half-time and despite many good goalscoring chances from the Blaugrana, there wouldn't be more celebrations on the 1st half. However, Real Madrid seem to have spent all their energies during the first 45 minutes and Barcelona would end by controlling the 2nd half completely. 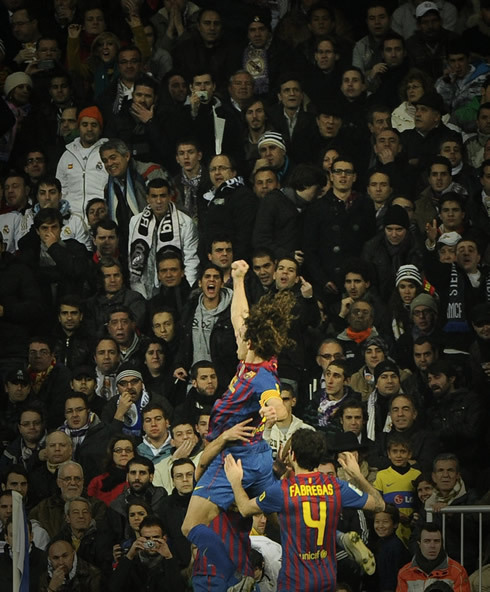 In the 49th minute, Xavi took a corner kick on the left, that Carles Puyol seized to head to the back of the net, leaving Iker Casillas with no chance to stop it. The equalizer was done and all those nightmares about Barça winning again at the Bernabéu were just returning to everyone's mind. The Blaugrana kept hiding the ball and forcing Real Madrid to chase it, which eventually led to a few incidents involving the usual suspects. Pepe, who was already shown a yellow card in the 17th minute of the game, couldn't hold his temper and ended by stepping on Lionel Messi's hand, when the Argentinian was on the ground and the referee had already whistled to stop the play. This incident was a good example of the huge frustration that inescapably gets Real Madrid players, whenever they are forced to run after the ball against Barça and both the game control and result start to slip away. In the 77th minute, the remontada was completed as Lionel Messi assisted Eric Abidal with a lob and the Frenchman finished it in style, as if he has been a striker for many years. With the 1-2 set on the scoreline, Real Madrid proved to be powerless to go after the draw convincingly and the game would end without any further major incidents. Real Madrid lost 1-2 and it seems to be this team's fate to never be able to overpower Guardiola's Barcelona. As it is usual already, we can expect an avalanche of critics over the next days, blaming José Mourinho for starting with such a defensive midfield (Xabi Alonso, Pepe and Lass Diarra). It's obviously easier to talk after seeing what happened, but trying to play on an equal footing against Barça, might also turn out to be a bad idea, as the 5-0 suffered in the Camp Nou proved to be. 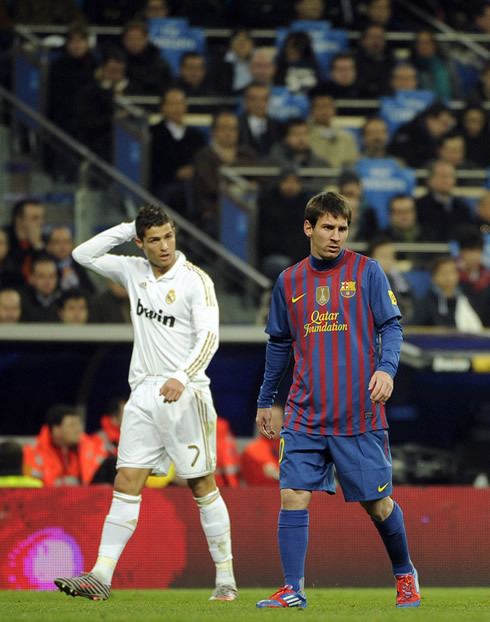 Should Mourinho risk being humiliated again in the Camp Nou by attempting to play toe by toe with this Barcelona, as that is probably the only way Real Madrid has to pull off a win against the Blaugrana? Or should the Portuguese coach think about containing damages already and not risk too much when travelling to the Condal city? After the loss against Barcelona in the Copa del Rey 1st leg, Real Madrid next game is against Athletic Bilbao, for La Liga, in the 22th of January, 2012. You can watch Juventus live stream, Real Madrid vs Athletic Bilbao, as well as Malaga vs Barcelona, and Swansea vs Arsenal from our football live streams section. Cristiano Ronaldo is expected to be on the line-up against Athetlic Bilbao, next Sunday.